In Episode 38 of the Icy Veins Podcast, we speculate about the Derek & Jaina Reunion Cinematic, discuss Hearthstone's Rise of Shadows expansion with Sophia, and go through main features of the latest Heroes of the Storm update that will go live next week. Don't forget to subscribe to the p﻿odcast in iTunes and leave a comment in this thread with your thoughts about the latest episode. If you enjoy our show, you can support it by becoming a Premium member. In Episode #40, we cover Essences, mount equipment, and the customizable trinket from Mechagon. Sophia helps us cover Hearthstone and we discuss fun Rise of Shadow decks and Ignoblegarden. [04:00] WoW: Patch 8.2 Unexpected Stuff: Essences, Mount Equipment, Customizable Trinket [19:00] Hearthstone: Rise of Shadows Fun Decks and Ignoblegarden Event [30:00] Overwatch: Storm Rising Event Don't forget to subscribe to the p﻿odcast in iTunes or leave a comment in this thread with your thoughts about the latest episode. If you enjoy our show, you can support it by becoming a Premium member. 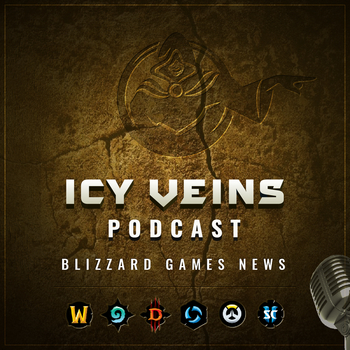 We're back with a brand new episode of the Icy Veins Podcast, where we talk with Deadset about Diablo's upcoming Patch 2.6.5 and Season 17 that wll be available for playtesting for a week starting Friday and we also cover what's coming in World of Warcraft's next major content update, Patch 8.2. [04:00] World of Warcraft: Patch 8.2 Details, Warcraft 1 & 2 on GOG [19:00] Diablo III: Patch 2.6.5 Details and Season 17 [30:00] Heroes of the Storm: The Caldeum Complex Event Don't forget to subscribe to the p﻿odcast in iTunes or leave a comment in this thread with your thoughts about the latest episode. If you enjoy our show, you can support it by becoming a Premium member. In the latest episode of our podcast, we talk about Patch 8.1.5 release date, Tools of the Trade items, and Island Expedition gear tokens. We also discuss the new Esports format and the Year of the Dragon in Hearthstone with Sophia. [05:00] WoW: Patch 8.1.5 Release Date, Crucible of Storms Loot Compendium, Darkmoon Faire Updates, Island Expedition Gear Tokens, Tools of the Trade Items, Mythic Dungeon Invitational [20:00] Hearthstone: Year of the Dragon, New Esports Structure [40:00] Overwatch: New Hero Details, Overwatch League Don't forget to subscribe to the p﻿odcast in iTunes or leave a comment on the forums. If you enjoy our show, you can support it by becoming a Premium member. In the latest episode of our podcast, we discuss potential Patch 8.1.5 release date, new Allied Races, recent layoffs at Activision Blizzard, and future game titles. [00:03] WoW: Patch 8.1.5 News Roundup, Allied Races, Crucible of Storms Raid, Wintegrasp [00:14] Overwatch: Paris Map Now Live, Overwatch League Season 2 Has Started [00:21] Heroes of the Storm: Currency Changes, New Patch with Ana & Abathur Reworks Live [00:23] General News: Layoffs at Activision Blizzard and Future Games Don't forget to subscribe to the p﻿odcast in iTunes or leave a comment on the forums. If you enjoy our show, you can support it by becoming a Premium member. In the latest episode of our podcast, Kat joins us to talk about her Double Rank 1 Legend rank and recent Card nerfs in Hearthstone. Overwatch's getting a Paris map that's now available for testing on PTR and Heirloom Upgrade Tokens will cost less in Patch 8.1.5! [00:02] Talking with Kat about her Double Rank 1 Legend [00:08] WoW: Patch 8.1.5 Mount and Heirloom Changes, Mythic World First Race [00:23] Hearthstone: Lunar Event Card Back, Card Nerfs [00:31] Overwatch: New Paris Map on PTR, Overwatch League Returning Soon [00:37] Heroes: New Skins on PTR, (Neo President) Anduin Leak, Kevin Johnson Leaves Heroes Team Don't forget to subscribe to the p﻿odcast in iTunes or leave a comment on the forums. If you enjoy the show, you can support it by becoming a Premium member.